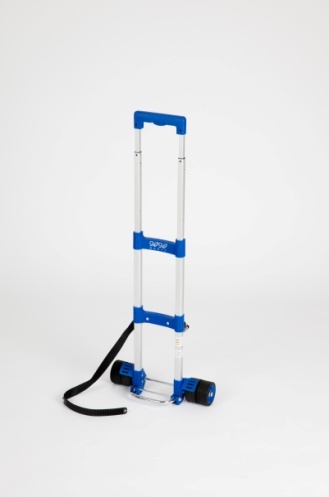 The Mini Travelmate Delivers All The Convenience Of The Original In A Lighter Compact Design. SAN JOSE, JUNE, 2013 – Go-Go Babyz Travelmate family just got bigger. Welcome the latest member to the innovative Travelmate family; The Mini Travelmate. Just as all the Travelmate products make traveling with kids and car seats a breeze, the new Mini Travelmate provides all the convenience and simplicity of the original QRKIDZ Travelmate in a more compact and lighter design. Weighing in at only 3.5 pounds with a sleeker design the Mini Travelmate makes strolling today’s larger car seats a simple task and leaves one hand free. The Mini Travelmate comes fully assembled and attaches to most toddler and convertible car seats in seconds with the same easy to use quick-release strap as the original. Now parents can enjoy their travels more as the Mini Travelmate significantly lightens the load and makes traveling with kids easy and stress-free. 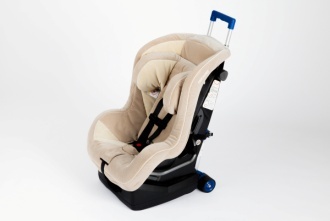 Go-Go Babyz® is a family oriented company that develops unique solutions for strollers and car seats that make life easier and children safer during travel. Founded in 2003, the father and daughter design team focus on safety and convenience for child transportation products. Our products were developed because, we found ourselves struggling with the products we were using, and we wanted added convenience. Furthermore, in the case of strollers, we found the need for additional safety. 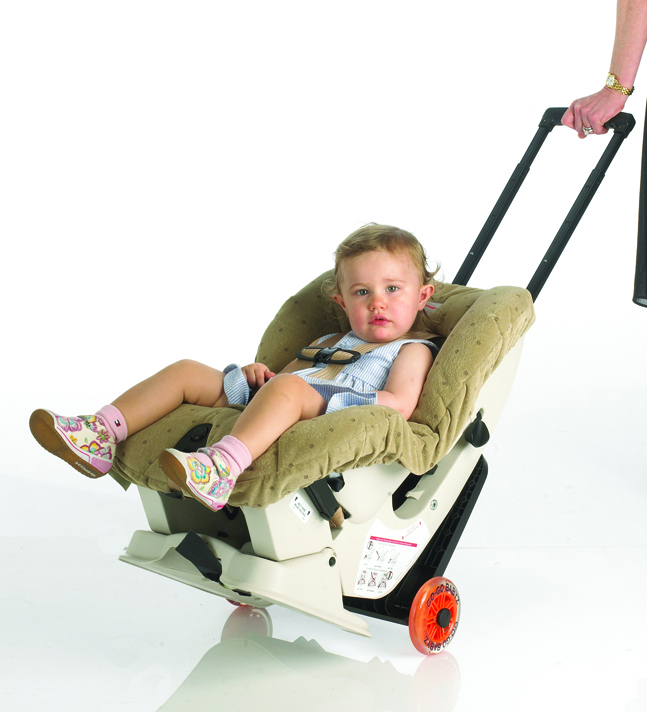 In addition to being members of JPMA, we are certified by the JPMA Stroller Certification Program, and all Go-Go Babyz® products are personally mom, dad and grandparent-tested. As you can probably gather from some of my previous posts I have not always been the best traveler so, I love tips and hearing other people’s experiences so I can continue to get better. I eat up anything that will help me be prepared and become a better traveler. Over the years I have become a much better traveler and the more I travel the better I get. Trust me, I always love being wherever our destination is, it’s the getting there that I would struggle with. International trips are still the hardest for me for pretty obvious reasons; longer flights, longer layovers, different languages and so on. In addition, I start thinking of all the horror stories people have shared over the years and I start to worry about things that might happen. Practice makes perfect. Our last international trip was to Spain for business and pleasure so we took the kids, which usually intensifies any anxiety I might have but, we had a blast and the travel portion was quite bearable for me. I actually enjoyed the entire trip from start to finish. What makes me a better traveler is being prepared, researching, and most importantly, remembering to be present to enjoy the journey! It makes a better trip for everyone. Here are a just a few basic International Travel Tips I thought I would share. They might seem simple and basic but those are some of the things that are often overlooked but can really make a difference. I like simplicity and try not to over-complicate anything. So, it’s a short list and I know there are so many useful tips out there so all of you veteran travelers out there please share your travel tips and experiences. Check your passport’s expiration date; if it will have 6 months or less on it when you will be traveling get a new one, some countries will not accept it. 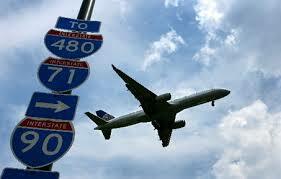 Check it as soon as you know when you will be traveling – just in case. You know how efficient government agencies can be and you don’t want to pay to have the process expedited. Make two photocopies of each passport. Leave one at home with a close friend or relative and leave the other in a safe place where you are staying in case you happen to lose the original. Along those lines, let a close friend or relative know what your general itinerary is. Do some research with the kids and get them excited. Let them help plan some of the activities. Make the journey part of the vacation and plan some fun things to do with the kids on the flight to keep them engaged, involved and entertained. Obviously, packing for a trip is largely influenced by the destination. The key topics I want to discuss today are what to bring on the plane and a basic strategy for packing in general. I always try to make it simple & easy; I bring only what I think we’ll all need. Kerry & I disagree quite a bit on this issue. I say less is better she says she would rather have too much than not enough. I say my way is right; I am the one carrying most of the stuff anyway so I should have more decision power right?! We recently went on a vacation for a week with the kids and here is how it unfolded. I get all the bags down. I have already decided that I am brining the bare minimum – I literally could have fit my clothes in a generous shoe box, and I still could have packed less! Anyway, I start strategizing about how to eliminate two bags when I see what Kerry has laid out for the kids: was way too much! So we reduced and I was able to pack all the kid’s stuff along with mine into one bag. I did it. That’s right! We flew United and they charge $25 a bag now . . . I’ll show them. It worked. However, I definitely could have reduced what the kids brought; next time. So, all was well until we got to the airport for the return flight. Both bags were overweight. We bought a few things, you know. So we get charged for that. So, my great strategy fell apart at the seams. What did I learn? My strategy was fine; I just needed better execution. Keep it simple and bring just what you ABSOLUTELY need. Do a load of laundry on the trip if needed (and possible). Minimize the number of bags but make sure they meet the weight requirements (usually below 50Lbs & remember to leave room for shopping). If you can’t succeed at meeting the weight requirement, split the bag into two smaller ones – the $25 bag fee is less than the overweight fee. Finally, and perhaps the most important strategy point: Take out as many things from your wife’s suitcase as possible while she isn’t looking! Again, Kerry & I may disagree a little bit but here is my list of things to bring in two bags, one for the kids and one for the adults. Snacks – nothing too messy or sticky for example, . . .
A small entertaining toy. Obviously, this will vary greatly per child our kids really like . . .
Keep in mind that this should easily fit in to a small backpack. Flight length will definitely play a role, but anything three or more hours should have these items. Yes, give in and get a handheld. I know, we didn’t have video games or DVD players when we were kids and we were fine right?! Fine, but this is a new generation and we must embrace the technological advances of our time. My recommendation for this is the Sony PSP Go – It is worth every penny! You can load games, movies and probably more. The screen looks small but the picture is clear. This is great for kids and adults (thanks to John for turning me on to this product). It is easy to use and very compact, unlike portable DVD players. I think we have gone through four of those things, each one with an average life of three trips. Hope this helps. Each trip gets a little bit easier for us, and I hope all my stress, anxiety, and mood swings during my travel experiences can make yours better! Remember, please share this with others and share your tips, tricks and thoughts with us right here on the blog and Facebook..